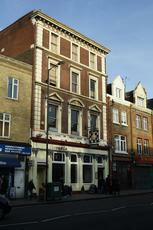 Nor rechristened the Camberwell Arms and a gastropub from the same owners of the Anchor and Hope in Waterloo and the Magdalen Arms in Oxford. Octopus on a bed of chickpeas was tasty even if the mollusc could have spent a little less time being seared. A pint of Bermondsey ale went down well of a Friday lunchtime - it was quiet but apparently is anything but most of the time. Hmm, never too sure about the Castle. The beer's always good, staff not too bad. But its the volume of the enormous telly malarchy that gets me out of there quickly.How many pubs need big screen as a perma feature? Maybe all by the look of London. Don't talk to me about people not holding pub conversations anymore! I visited with some friends 2 weeks ago and was pleasntly surprised. It's a little oasis on an otherwise extremely busy main road! Inside the music was 80s (my era) and then later more up to date.The staff were extremely polite, and attentive, and the menu was clear, easy to understand (i didn't need a dictionary to decipher any words) and the food was excellent. The appearance of the manager, a friendly and very laid back gentleman, who joined us for a drink, confirmed my first thoughts...I'll definately be going back. Nice place. Comfortable environment. Staff attentive but not over the top. Food selection a different to the usual. Used to come here when called The Snug. Much the same in layout. I think it use to be trendy-ish (when i used to go - joking). Either I'm getting older or its lost its edge, actually both those statements are true. Don't like the chandeliers, they look grubby which in turn gives the whole room a dirty feel. Now that you can't smoke inside maybe they should think about giving them a clean. The 'Art work' is VERY hit and miss. Don't serve Stella!! But serve Kronenberg which to me always tastes a little weird. Had dinner there late (10pm) one Sunday about a month ago, the waitress was fantastic, did her best for us with the by then limited menu (Sunday Roasts were out), what I had instead was delicious. Can't remember what now, although I do remember being unimpressed when desert arrived and the cream had obviously come out of a spray can!! Mind you at least they were brazen about it.